Jenkintown code enforcement gets double-plus good. 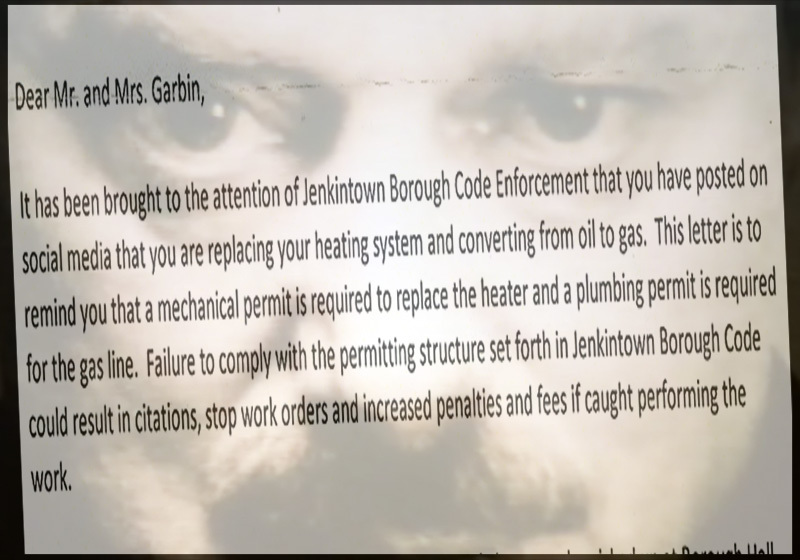 HomePolicyJenkintown makes code enforcement double-plus good. Jenkintown makes code enforcement double-plus good. A few weeks ago, I made the mistake of recommending to a fellow resident seeking a contractor for a furnace replacement that he might do the work himself. Facing a similar project, I consulted a friend and fellow DIYer, who told me that the job no more requires a contractor than does the replacement of a washing machine. My friend and I plan to convert my system from oil to gas. I look forward to the savings in energy, money, and space. About a week and a half after I posted my intentions on the Jenkintown Community Group page on Facebook, I received an official letter from the borough signed by Kevin Lynch that due to my “posting on social media,” he felt it necessary to remind me of my obligations to the Borough, namely the permits I need to file and pay for. Yet again, the Borough provides another revealing window on their operation. I never stated an intention to “stick it to the man”, so it makes one wonder that in a town riddled with ongoing, unaddressed code violations, the Borough would take the time to single out someone discussing a furnace upgrade on Facebook. I wish my description of Jenkintown as “small town politics at its smallest” didn’t have such a ring of truth, but rarely does a month pass by when it lives up to that reputation. Should we add permit fees to the whole “death and taxes” thing? We seem to have come to an understanding as a society that whenever we want to do something to our property, we probably need a permit. Government and apologists for statism will snap back that the permitting process is for our own safety and the good of the community, but is it really? When I filed a Right to Know request to for copies of all the sidewalk permits, I first asked if the Borough could provide me with the grand total of contractor estimates for the work performed. They said they did not compile that information, and that some of those permits didn’t have that line item. Considering the incredulity of this, I pressed on with my request, only to find that the Borough did indeed distribute no fewer than four versions of the permit, two of which did not ask for the contractor’s estimate, a line item it said it didn’t require in any case. The form didn’t provide such a disclaimer, which meant that a healthy percentage of people did thankfully provide it. So, if the Borough does not compile any of the information in a database, does not provide a uniform application process, and doesn’t care what you and I spend on our sidewalks, why do they charge for these permits? To offset the cost of having George Locke walk, excuse me, drive out to the worksite, look at the work, and say, “Looks good to me”, all the while he’s on the Borough clock anyway? To whom does this make sense? Incidentally, they honored my request before they realized they could charge me to redact the names and phone numbers on the permits. All I sought was the total cost, which they could have easily provided had they took the $25 and paid a temp to enter the information into a spreadsheet. Not to worry, Mr. Ryan. If I do the work, the Borough will get its money. I don’t have an issue with having a third party inspecting the work, but if I’m already paying that third party’s salary, how is that not a cash grab, plain and simple? Money for nothing, indeed, and yet another example how our government nickels and dimes us out of the rewards of our hard work.